At that point I show them the chart in the exam room that links time of day to certain parts of your body. The chart is based on the Chinese meridians, which state that each 2-hour block of the day is governed by a different meridian. Meridians are energy currents that flow through your body. They are primarily addressed by acupuncture. However, the meridian system informs a type of chiropractic which I have studied. The hours between 11pm and 1 am are governed by the gall bladder meridian. Emotionally that is associated with resentment. It can be your resentment or your response to someone else’s resentment. It can also be associated with knee problems. The hours between 1am and 3am are governed by the liver meridian. Emotionally it is associated with anger and physically associated with your shoulder. The hours between 3am and 5am are governed by the lung meridian. Emotionally it is associated with grief and physically with the muscles around your lungs. The hours between 5am and 7am are governed by large intestine. 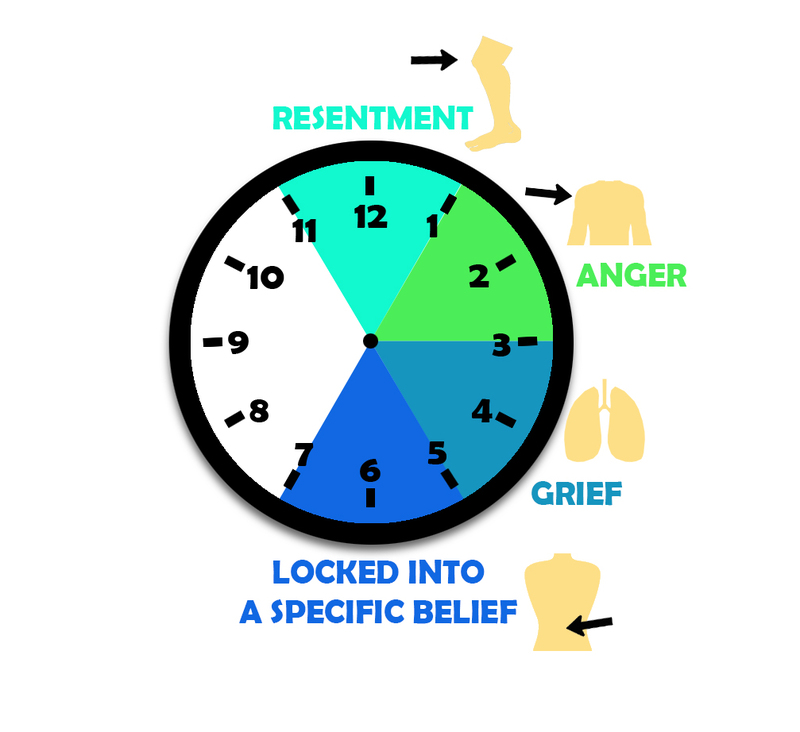 Emotionally it is associated with being locked into a specific belief or way of thinking. Like all other meridians, the emotion can be either yours or your experience of other people being locked in their thinking. Physically it is associated with your low back and pelvis. If any of this sounds familiar, give us a call! We have helped a lot of people with insomnia and the emotional components of their pain.